3. A window will come up. Look at the pic below. Instructions – Warning: Proceed at your own risk! Browse to C:\Windows\inf\ and make a backup copy of sysoc.inf. break certain functionality in Windows. A hidden message or feature in an application. This guide covers the undocumented and hidden features in Windows XP. All of the following were tested in Windows XP only. Instructions – Go to “Start”, “Run” and Type defrag c: -b to defragment the Boot and Application Prefetch information. Windows XP will run this automatically every three days or so, during system idle periods. BootVis will evoke this when you run the “Optimize System” function. There is no need to manually run this unless you wish to immediately optimize a newly installed application’s load time. can be an .inf file or an executable program. IExpress technology automatically removes the setup files after installation, saving the user time and frustration. I had been hired to work at one of telecommunication enterprise in Indonesia, that is PT. Telkom. During I worked here, I handled ’bout ADSL technology, Installed ADSL connection, Computer Networking and troubleshooting that relates the internet. Here, I spare mytime to survey the best and the worst modem by giving the questions to costumer for collecting data ’bout modem they use. There are 4 trade of modem I make become samples. Those modems usually get ‘hang’ and need refresh.For 3 months, June – Augut 2007, I surveyed these that most of bad performance reasons are from CPE/Costumer Premises Equipment (at costumer part). 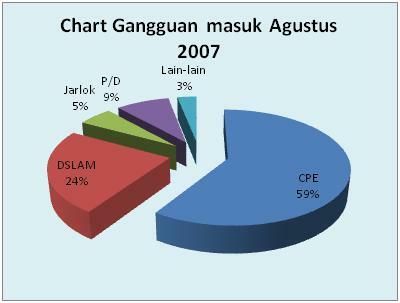 The Chart below took from monitoring software at PT. Telkom.